﻿﻿﻿Carolyn Hancock is in her second term as President of the Pastel Society of Southeast Texas. Additionally, Carolyn is active in numerous other art groups in the Ft. Bend area and she is an Associate Member of the Pastel Society of America. Carolyn is also a website designer, blogger and author of the newsletter Scrumble. Her articles have appeared in Fine Art Views daily newsletter and the online magazine Artists on Art.﻿﻿﻿ ﻿View her website﻿. CH In 1971 I fortuitously walked by a YMCA art class, peeked in and signed up. It was pastel and it was portraiture. Loved it, but did not pursue it. Twenty years later, an Absolut Vodka advertising campaign selected Louisiana artist George Rodrique to incorporate its logo bottle into a painting. When I saw the full-page ad, my reaction was, “I can do THAT!” Out loud. To my husband. Pretty much had to try it, didn’t I? Bill praised my awful version of Blue Dog, framed it and hung it in his office. A few years later, life let me choose anything I wanted to do with my time. Pastel and portraiture came out on top. Artists On Art Magazine printed the full story. PSST Where do you paint? Home, studio, corner of a room? How is it set up? 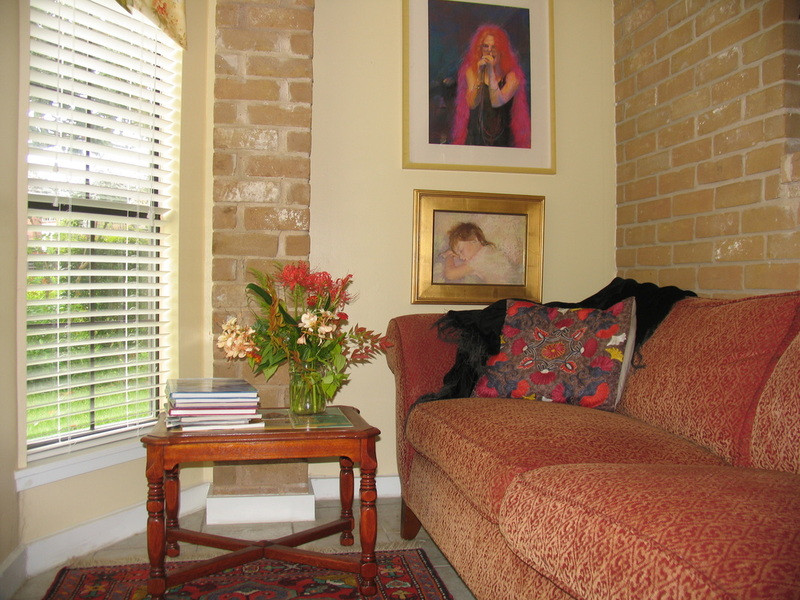 CH My home studio is a long, narrow sunroom facing the golf course, practically floor to ceiling light. Even with the natural light, I rely on an overhead fluorescent fixture with 4 daylight bulbs for painting. One end of the studio is like a pretty sitting room: sofa, bookcase, my grandmother’s rocker. I can look across the room to study a work in progress or grab a book to solve problems (and sometimes take a nap!). The other end of the studio is the work side; how messy/clean it looks depends on where I am in a painting. 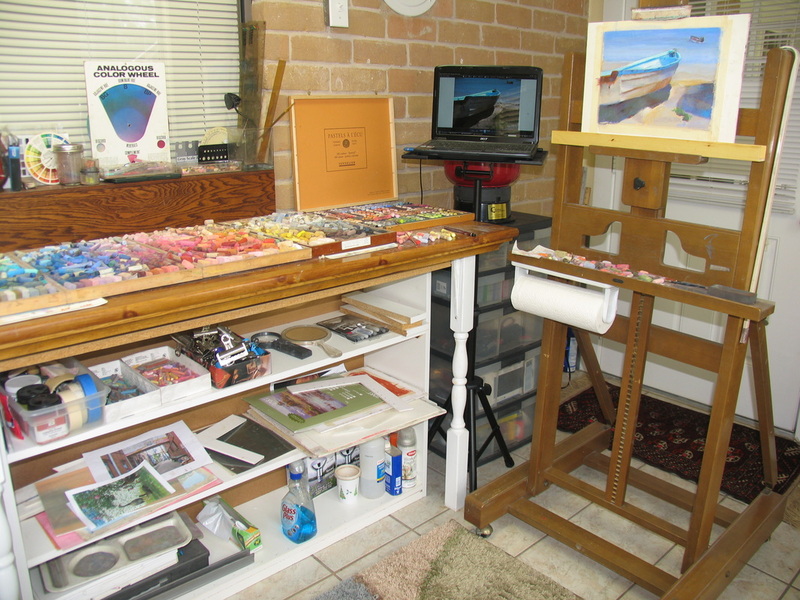 A long table holds my pastels at hand level, a tripod stand holds my laptop for digital reference at eye level. A rolling bin holds tools and a Cherry Pastel Cleaner. The centerpiece is a sturdy, adjustable easel that I bought while living in Japan. A worktable anchors the middle wall; it’s for framing, sketching, dreaming. PSST What is your subject matter and how do you choose it? CH The answer here is best from my website: If I could paint only one thing, it would be the face in that small window of time that says, “this is me.” I love painting people in candid, unposed situations, and frequently crop in so the focus is on the face, not the environment. I wander off into landscapes, but always return to the people. PSST What is your art background? Academic, self-taught, workshops? CH My first step as an artist turned out to be the best: at Mission Renaissance in Los Angeles, I learned the fundamentals of drawing and value. I took art and life drawing classes at UCLA and Pasadena City College. A year later we moved to Japan; I had to learn portrait drawing from a Daniel Greene video. I’ve taken workshops with Greene, Doug Dawson, Bob Gerbracht, Anatoly Dverin and other pastel artists that I admire. Constant study and many struggling hours of painting round out my background. PSST Who or what has been your greatest source of encouragement? PSST Is there a single incident, a quote, or an award that will always have special meaning to you and why? CH From a customer who did not buy: You had many pieces I came away unable to forget. PSST What is your “favorite thing” you use in painting? A special gadget or tool you have discovered or a special technique that you have developed that you would pass on to others? CH My most-used tool is a homemade pastel sharpener, a small jar with drywall screen laid across the top with a screw-on lid holding it in place. It’s great for getting a point on NuPastels or an edge on softer ones. A second tool I use a lot: an ordinary café curtain rod with one end bent to fit over the back of the easel – keeps those finger tip smudges away. PSST How do you describe your painting style and color choices? CH My painting style is in transition. I first learned drawing with the Daniel Greene method: a detailed drawing of the face from inside out, adding all shadows. Now I’m going for a more painterly, looser effect, using Alain Picard DVD’s as a guide. My color choices are intuitive and frequently see unexpected color combinations that, in the final, read as true. Sometimes my hand reaches for a color and my brain says, “oh, no, surely she’s not going to do that. PSST What do you consider your best painting ever and why? CH Perhaps not the best, but the most emotional is Eyes to the Future. 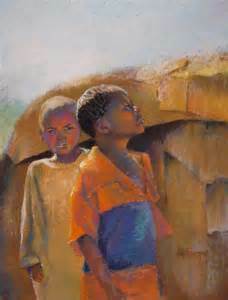 It portrays two boys from the Samburu tribe in Kenya. Their western clothes are dirty, torn and too big. While the older boy looks upward with anticipation, the younger boy peers straight on, cautious. Their faces painted the title, each with a different view of the future. PSST How do you sell/show your work? Galleries, online, home studio tour, open house? 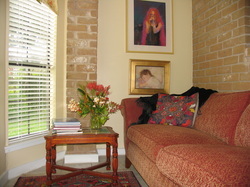 CH My website, http://carolynhancock.com is my figurative art gallery, and http://alittleartfromtexas.com exhibits my landscapes. In November, eight artists in my community held an open studio tour; its success made me understand the importance of personal contacts. PSST What is your price range? CH My small landscape and flower paintings are priced $375. Figurative works range from $500 to $1200. Basically, studio pieces are priced according to size, commission pieces at a higher rate. I also use the formula height x width x (a dollar amount, i.e., $3.5). PSST Do you have any marketing or exhibiting tips that you would like to share? CH Own your art world: Get a website and write a blog. Websites are incredibly inexpensive and easy to create. Nothing else gives an artist such long-term exposure and credibility. Photograph every painting with a good quality camera to have high resolution images ready for your website and promotion. Most important: the people you already know are the most likely to buy your work—keep in touch, let them know about your website and blog. PSST What social media, websites or art-focused groups are you associated with? CH I am active on Facebook and its pastel related groups, like PSST and Pastel Society of America. I have Google Plus, Pinterest, Blogspot, and Linked In; but with their continual policy changes, I am rethinking how to use social media. My websites, blogs, and newsletter are my primary input sources, but I am considering a different approach. I am an Associate Member of PSA, member of artistsoftexas.org and figurativeartist.org and, locally, the Art League of Fort Bend and Arts Fulshear. I am continuing as the 2015 President of PSST. PSST What are your goals as an artist? CH The number one goal all of my life has been to keep learning; that spills over into my art journey. Specific 2015 goals are to learn better composition, to find a way to get my work in front of more people, and to attain PSA signature status. PSST What do you hope people gain from viewing your work? CH I’m going back to my website for this one: When my pastels create an emotional connection with the viewer, and a smile, I feel I’ve made a strong painting; that is my passion. PSST Do you have one quote or testimonial from a collector that you can share? CH From a special friend, supporter and collector: I have just taken the most wonderful imaginary trip, through your marvelous artwork ~ I was struck by the beauty of the colors used, the fabulous choice of assorted subjects, the exquisite use of our beloved medium with an extraordinary sense of your own technique. Well, I’d love to have that impact on everyone!